When Tinker Bell and Vidia find Lizzy’s fairy house Tinker Bell accidentally gets locked in and captured. Hijinks and fairy trouble ensue. 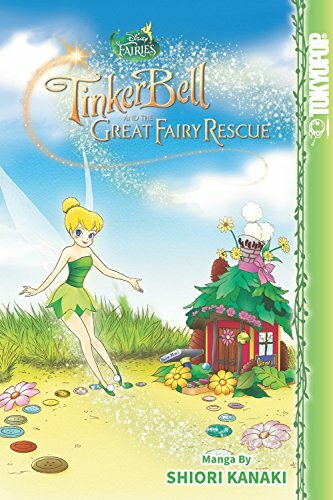 Tinker Bell and the Great Fairy Rescue a sweet Tinker Bell story converted from the movie (which I haven’t seen) to manga. It’s really nicely written, and the manga is drawn in a style that matches the storyline, sweet and innocent in many ways. It’s definitely traditional Disney fairy fare. If you enjoy manga or the Disney fairy/Tinker Bell animated movies, you’ll enjoy this manga. In addition to the Tinker Bell story, there are previews of other Disney Fairy manga, a Grimm’s fairytale, Town Musicians of Bremen, from Grimms Manga Tales – which is rather darkly and traditionally drawn in contrast to the other stories, and a Stitch short story, Stitch Meets Yuna, which is cute and typically Stitch-ish. There are also some ads for other Disney manga titles. Highly recommended for anyone who loved the Disney Tinker Bell and Fairy animated movies, loves manga, or simply enjoys a sweet children’s book.